8 Best Mattresses for Heavy People 2019 - Are You Overweight or Obese? Finding the right mattress for your needs can be difficult in any situation, but this problem is often compounded if you’re a heavy-weight person. You need a mattress that offers plenty of support, but at the same time it still needs to be plush and comfortable enough for you to get a good night’s sleep. With these difficulties in mind, we’ve put together this article containing some useful information about mattresses for heavy people. Here, we will explain how to choose the best mattress for heavy people, and also give you our top eight choices for the best mattress for heavy people. This mattress is an excellent choice for anyone who weighs over two pounds. It is ten inches thick and has three layers constructed out of various memory foams (all of which are CertiPUR-US certified to contain no harmful chemicals or emissions) that are specially designed to provide high levels of both comfort and support. Part of its great effectiveness for heavy-weight people comes from the base layer that makes up the foundation of the mattress; at five and half inches thick, this foundation layer is made out of high-density foam and helps to provide strong and reliable support for your body while you rest. In addition to this durable and supportive base layer, the Zinus Ultimate Comfort Mattress also features a middle layer of comfort foam that is two inches thick and designed to help relieve both pain and pressure. And finally, the top layer of the Zinus Ultimate Comfort Mattress is made out of two and a half inches of plush memory foam. This layer is specially designed to provide you with supreme levels of comfort; it contours to the curves of your body and can even adjust and adapt to your movements if you change position in the middle of the night. Ultimately, if you want an all-foam mattress that can offer both great support and great comfort, this is an excellent choice for you. Great support, especially for heavy people. Great comfort; contours to your body and adapts when you move. Constructed out of CertiPUR-US certified foams. There may be a slight odor when you first unpack it. Limited warranty of only five years. This high-quality mattress has three unique layers and is specially designed to help provide you with body-contouring comfort as well as pressure relief. The bottom layer of the Leesa mattress is constructed out of six inches of high density support memory foam; this sturdy foundation layer gives the mattress excellent durability while also helping to provide even heavy-weight people with great levels of support. The middle layer, meanwhile is two inches thick and made out of pressure-relieving memory foam. This middle layer is extremely helpful for alleviating back pain and muscle tension, which makes falling asleep and staying asleep easier. The top layer of the Leesa mattress is made out of a special type of memory foam called Avena; an alternative to latex foam, Avena foam is specially designed to promote comfort while also increasing air flow and responsiveness within the mattress. That extra responsiveness from the top layer in combination with the pressure relief provided by the middle layer helps this mattress to adapt to your individual needs and give you a comfortable sleeping experience no matter what body type you have, making it one the best possible choices if you want a mattress that is great for offering both pressure relief and comfort. Great temperature regulation; sleeps cool thanks to the Avena foam. Great for pressure relief and body-contouring comfort. Can feel too firm for anyone accustomed to a more plush mattress. Complicated to return if you decide you don’t like it. Slight off-gassing odor when you first unpack it. This mattress is great for people of all weights and heights. The base layer that makes up the foundation of this mattress is seven and a half inches of high density foam that helps to provide excellent support for you while you rest, even if you’re a heavy person. Furthermore, the LUCID mattress features a top layer that is two and a half inches thick and constructed out of gel memory foam. This top layer of foam is specially designed to provide you with high levels of comfort while also helping to keep your spine aligned and provide good support for your hips and lower back. 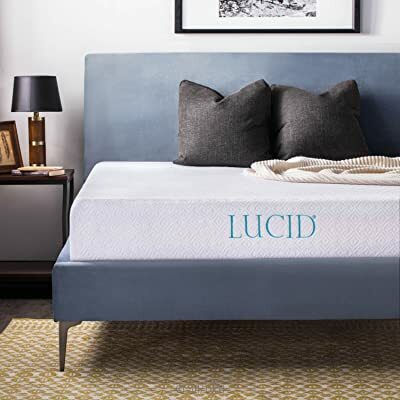 This mattress is also designed to feature great breathability and temperature regulation, meaning that it can help keep you cool and comfortable while you sleep; with the LUCID mattress, you won’t need to worry about overheating and feeling sweaty and uncomfortable while you rest. This is incredibly important if you’re a heavyset person, because it’s very easy to get overheated while sleeping if you don’t have a mattress with good ventilation and temperature regulation. Comes with a warranty that lasts twenty-five years. Minimal motion transference/great motion isolation. Very reasonably priced; good quality for the price. Good for comfort and back support. Good for back sleepers and stomach sleepers. Shorter trial period of only thirty days. This mattress is available in thicknesses of up to twelve inches and features a design that involves two layers of memory foam as well as a foundation layer made out of high-density support foam. Additionally, all the foams used in the Signature Sleep Memoir mattress are CertiPUR-US certified, meaning that they are guaranteed to not contain any harmful chemicals, emissions, or toxins. Part of why the Signature Sleep Memoir mattress is such a great choice for heavy people is that the memory foams used in this mattress are specially designed to help with weight distribution and support, while also remaining responsive enough to adapt and adjust if you need to shift position or get out of bed. Furthermore, the foundation layer of this mattress is constructed out of eight inches of strong support foam. 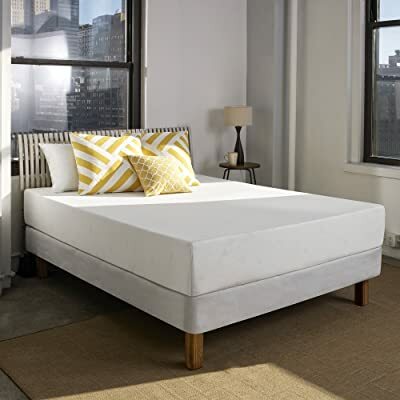 And not only is this foam adaptive and supportive like the rest of the mattress, but it also provides the whole mattress with additional durability and stability. And in addition to all of that, the Signature Sleep mattress is also very affordable and easy to take care of and maintain. Each and every Signature Sleep Memoir mattress comes with a soft cover that is designed to be breathable and also easy to clean; it even has a zipper for easy removal and can be laundered in a washing machine. Cover can be washed easily. Very durable with great stability. Foams are CertiPUR-US certified for health and safety. Great for even weight distribution and support. Slight off-gassing odor when it first arrives. Short warranty of only a single year. 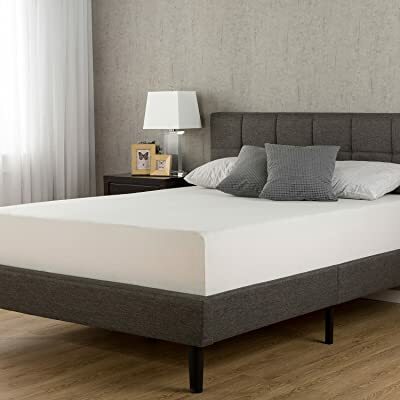 If you want a deluxe memory foam mattress that offers excellent support for a reasonable price, then the SureTemp mattress from SleepInnovations might be the perfect choice for you. SleepInnovations is a company dedicated to providing mattresses that work well for everyone, which is why every mattress they produce is of incredibly high quality. This mattress is in fact considered one of the best mattresses for heavy people due to its design. At twelve inches thick, it is one of the thicker all-foam mattresses currently available on the market. But even with this extra thickness, you don’t need to worry about the mattress being too plush and lacking in support. Rather, this mattress is designed to be firm and supportive, and is capable of bearing large amounts of weight without issue. The bottom layer of this mattress is nine and half inches thick. This thick foundation layer is constructed out of special structured memory foam that is designed to provide high levels of support and stability. This layer can help with pressure and pain relief while also staying firm enough to keep you from sinking into the mattress too far. The top layer, meanwhile, is made out of the SureTemp foam the mattress is named for. This specially designed foam (which is exclusive to SleepInnovations) provides both comfort and temperature regulation, helping you to stay cool and relaxed while you sleep. The great temperature regulation of the SureTemp foam comes from the special open cell design that gives it the ability to contour to the curves of your body while still allowing heat to dissipate (rather than build up within the mattress and causing you to overheat while you sleep). This makes SureTemp foam a significant improvement over regular memory foam, which is fairly notorious for its heat-retention qualities. 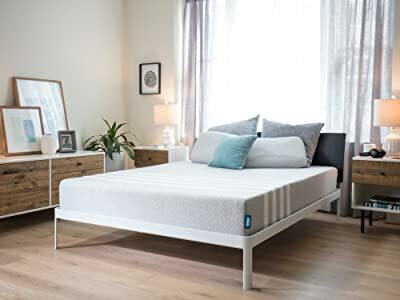 Ultimately, if you want an all-foam mattress that is firm enough to give you great back support while also sleeping cool, this is a great choice for you; it’s particularly helpful for anyone who sleeps on their back or on their stomach. 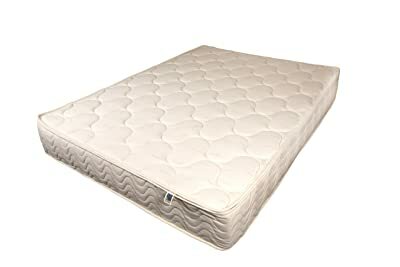 This mattress is an organic hybrid mattress that features latex; it is available in a pillow-top variety as well as a non-pillow-top variety, with the only significant differences between the two varieties being an additional two inches of latex contained within the pillow-top variety. 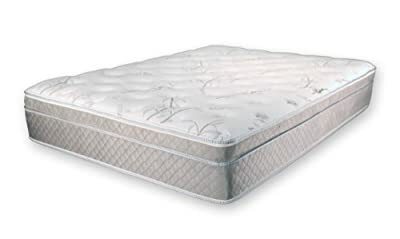 This mattress is notable for featuring a strong support core that is constructed out of pocketed coils and an inch of Dunlop latex. These coils are in both the center of the mattress and along the perimeter of the mattress, helping to give the mattress great support as well as great edge support. This firm support is excellent for anyone who is more heavy-set and wants a firmer mattress to support their body weight; furthermore, this mattress is great for pressure relief and motion isolation, too. Additionally, this mattress is entirely organic; the latex used in the latex layers is organic, and the mattress cover is made entirely out of organic cotton as well. Therefore, this mattress is a great choice if you want a high-quality mattress that offers both firm support and pressure relief. This mattress is also a hybrid, and an excellent choice if you weigh over two hundred pounds (but under three hundred, since that is the weight limit the company advises for this mattress). This mattress can offer many great benefits such as a thickness of twelve inches (which includes a high-density base layer that provides additional stability and support) and excellent temperature regulation. It also offers great motion isolation and excellent support in its entirely, both in the center of the mattress and at the edges. Another great benefit to this mattress is that the latex used in its construction is hypoallergenic, anti-microbial, and even resistant to dust mites. One notable downside to this mattress is that it won’t be very comfortable for anyone who wants a firm mattress. While you can select your desired firmness level at the time of purchase, this mattress by design tends to be more plush rather than firm, and the firmness level is also reported to decrease over time after repeated use of the mattress. Good motion isolation/minimal motion transference. Not comfortable for anyone who wants a soft or plush mattress. The Spindle mattress is a great choice if you’re a heavy-set person and want a mattress that offers great support while also being more responsive than other types of mattresses. It’s also the best option available if you want a mattress made entirely out of latex. The extra responsiveness of this mattress comes from the fact that it is made from latex rather than traditional memory foam; latex has a bouncier feel to it, making for a mattress that reacts more readily to movement. Furthermore, you don’t need to worry about purchasing a mattress that is too soft and plush to support your weight; this mattress is only available in firmness levels of medium and firm. Additionally, this mattress is unique in that there is a certain amount of customization available. The three foam sections of this mattress arrive packaged individually, allowing you to arrange them according to your individual needs. One significant downside to this mattress, however, is the hefty price tag. While most people who choose this mattress admit that the higher cost is worth it, if you’re on a tight budget it’s probably not the best option for you. Layers come packaged individually, allowing for greater customization. Not very much edge support. No option for a soft or plush mattress; you can only get medium-firm or firm. More motion transference than a foam mattress. If you weigh a lot, you’re going to need a firmer mattress that can support your full body weight; it’s also important for your mattress to be firm enough to prevent you from sinking in too deep, which can throw your spin out of alignment while you sleep. While certain memory foam mattresses can offer enough firmness, the best options for heavy people are usually going to be latex mattresses (which are firmer and more responsive than traditional foam mattresses) or hybrid mattress (which typically consist of a memory foam mattress with an innerspring core). If you’re a heavy person, it’s likely that you give off a lot of body heat while you sleep. It’s for precisely this reason that temperature regulation is an important quality to look for in a mattress. If you choose a mattress that has poor temperature regulation, then your mattress is going to retain too much heat while you sleep and cause you to become overheated and uncomfortable. Therefore, it’s important to find a mattress that is designed for greater breathability and heat dissipation. Some mattresses are better for certain sleeping positions than other. If you sleep on your side or back, for example, you’re going to want a different sort of mattress than if you sleep on your stomach. This is because different levels of support are needed for the different sleeping positions in order to maintain proper spinal alignment while you sleep. As you can see, there are a variety of great mattresses for heavy people available for purchase. Simply take into consideration which qualities you care about the most (pressure relief and support for your back, for example, or temperature regulation to keep cool at night when you sleep) and move forward from there to find the right mattress for your needs.